The global smart camera for security & surveillance market is estimated to grow from USD 1.93 Billion in 2015 to USD 3.06 Billion by 2020, at a CAGR of 9.7% from 2015 to 2020. The global smart camera market for security & surveillance has been segmented into sensor technology and scanning technology. Both these segments individually cater to the global market. The sensor technology segment of the global smart camera for security & surveillance market has been further classified into CMOS and CCD. The scanning technology segment of the global smart camera for security & surveillance market has been segmented into line scan and area scan. Geographically, the global smart camera market for security & surveillance has been segmented into the Americas, Europe, Asia-Pacific, and rest of the world (RoW). The key players operating in the global smart camera market for security & surveillance were identified across different regions, along with their offerings, distribution channels, and geographical presence. Moreover, the average revenue generated by these companies, which have been segmented on the basis of region, was used to arrive at the overall market size. 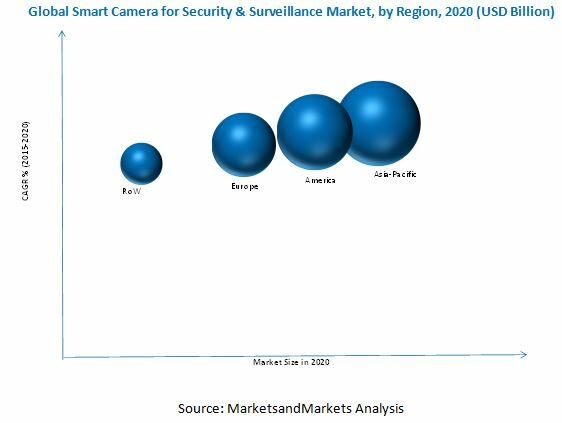 This overall size of the global smart camera for security & surveillance market was used in the top-down approach to estimate the sizes of various subsegments via percentage splits from secondary and primary research. The entire procedure included study of annual and financial reports of the top market players and interviews of the industry experts, such as CEOs, vice presidents, directors, and marketing executives to obtain key insights regarding the global smart camera market for security & surveillance. This report provides valuable insights regarding ecosystem of the global smart camera market for security & surveillance comprising product manufacturers and suppliers, original equipment manufacturers (OEMs), system integrators, middleware and firmware providers, suppliers and distributors, technology providers, service providers, and manufacturers of electronic devices. This study answers several questions of the stakeholders, primarily, by providing insights on the market segments that need to be focused during the next two to five years for prioritizing efforts and investments. The global smart camera for security & surveillance market is estimated to grow from USD 1.93 Billion in 2015 to USD 3.06 Billion by 2020, at a CAGR of 9.7% from 2015 to 2020. The major driver for the global smart camera market for security & surveillance is the increasing usage of smart cameras for security & surveillance purposes in various applications, such as public spaces, military & defense, transit facilities, commercial facilities, enterprise & government infrastructure, and residential infrastructure. Smart cameras for security & surveillance have specific applications across various industry verticals. The fastest-growing application segments of the global smart camera for security & surveillance market are commercial facilities, public spaces, and residential infrastructure. There is an increase in the demand for smart cameras for various security & surveillance applications, such as protection from terrorist attacks, in household security market, in smart buildings, and outdoor security market. Continuous technical advancements are being carried out for the development of better quality smart cameras. The growing concern for national security among countries of the world is one of the factors driving the demand for smart cameras, which in turn, is fueling the growth of the global smart camera for security & surveillance market. The global smart camera market for security & surveillance has been segmented into two types, namely, sensor technology and scanning technology. These segments individually cater to the total market. The CMOS subsegment of the sensor technology segment is expected to lead the global smart camera market for security & surveillance between 2015 and 2020. Smaller size, low power consumption, ease of integration, faster frame rate, and lower manufacturing cost of CMOS sensors are the factors leading to the growth of this subsegment. The area scan subsegment of the scanning technology segment is expected to lead the global smart camera market for security & surveillance during the forecast period. This subsegment is projected to grow at the highest CAGR between 2015 and 2020. Area scan cameras can capture images of preset resolution in both directions, that is, in terms of length and width of an object. Area scan cameras can be used in almost all the applications where the object whose image is to be captured is not stationary. Geographically, the global smart camera for security & surveillance market has been segmented into the Americas, Europe, Asia-Pacific, and rest of the world (RoW). The Asia-Pacific region is projected to lead the global smart camera for security & surveillance between 2015 and 2020. The Asia-Pacific smart camera market for security & surveillance is projected to grow at the highest CAGR during forecast period. The growth of the Asia-Pacific smart camera for security & surveillance market can be attributed to the technological developments taking place in the Asia-Pacific region. Besides, the region is also emerging as a manufacturing hub for smart cameras. The public spaces, military & defense, and transit facilities are the application segments of the Asia-Pacific smart camera for security & surveillance market that are expected to witness increased growth during the forecast period. Various countries, such as China, Japan, and South Korea are driving the market for smart camera for security & surveillance market in the Asia-Pacific region. Interface of smart cameras, such as GigE vision relies on a CPU to process each incoming packet, with associated multiple interrupts per received image. These images are later forwarded to the receiver, thereby increasing the CPU load. A high CPU load inevitably results in processing delays in the host PC and reduces image processing capability. This is one of the major factors that may restrain the growth of the global smart camera market for security & surveillance. Some of the key companies operating in the global smart camera for security & surveillance market include FLIR Systems, Inc., Canon Inc., Samsung Techwin Co., Ltd., Sony Corporation, Panasonic Corporation, Bosch Security Systems, Inc., Raptor Photonics Ltd., and Watec Co., Ltd. FLIR Systems, Inc. adopted strategies of new product launches and acquisitions to gain substantial share in the global smart camera market for security & surveillance. For instance, in 2015, FLIR Systems, Inc. announced acquisition of DVTEL, Inc. (U.S.). This acquisition is expected to help the company to develop software and hardware technologies for advanced video surveillance. Furthermore, the company is also known for its large-scale sales channels and distribution networks, which help it to increase its market share, globally. 10.1 Bosch Security Systems, Inc.
10.6 Samsung Techwin Co., Ltd.